As I write, the prisms from a crystal star left over from Christmas swirl around me in the late afternoon sun. They resemble the many facets I find in this novel, each singular yet inexorably connected. It is the story of a friendship, the continued story of Elena and Lila which began in My Brilliant Friend. Here the terms of friendship are even more loosely defined, at least if one looks at a friend as someone who stands by you. Who encourages you, and loyally supports your goals. We can’t say that is true of either girl, but particularly of Lila. Beautiful Lila; manipulative Lila; selfish, loud, and brilliant Lila. Much of the first half of this novel is about her stealing Lina’s love, Nino. It doesn’t matter that Lila has married Stefano, that she lives in a beautiful home with plenty of money, that she has at her fingertips the ability to design shoes beyond compare. Instead, she wants what Lila wants, even if it means taking the boy that Lila as set her eyes on. We can’t encapsulate Lila’s manipulations into stealing a boyfriend. Her schemes are much more involved than that. She picks up, and discards people, as if they were her son’s toys. She flaunts her beauty and her wealth and her marriage as if each of these things is unimportant; they are thrown in the face of her friends who have much less. The truth is, I don’t much like Lila. I want her to be so much more. Instead, my affections lie with Lena. Hard-working, plain Lena has emotions which resonate deep within me. She fears she is not smart enough, even though she has come from parents with no education beyond elementary school and achieved a degree in Literature from Normale University in Pisa. Even though the outpouring of her heart, over the terrible things that happened while she and Lena were on vacation in Ischia, has resulted in the publication of a novel. While they do not seem to foster one another’s growth or achievement, Lena cannot seem to be without Lila for long. When she finds her friend at the end of the novel, working in a sausage factory under the cruelest conditions, even then there is no rejoicing at Lena’s accomplishments. I understood that I had arrived there full of pride and realized that -in good faith, certainly, with affection- I had made that whole journey mainly to show her what she had lost and what I had won. But she had known from the moment I appeared, and now, risking tensions with her workmates, and fines, she was explaining to me that I had won nothing, that in the world there is nothing to win, that her life was full of varied and foolish adventures as much as mine, and that time simply slipped away without any meaning, and it was so good just to see each other every so often to hear the mad sound of the brain of one echo in the mad sound of the brain of the other. Perhaps in every friendship there are elements of undermining one another, or certainly of comparison. Perhaps at any time, one is more successful than the other, and friends take turns in savoring the joyous moments of their lives. Whatever the case, I am moved by this book for the friendship that it portrays, as well as revealing the inner thoughts and motivations behind the characters. I feel I live among them, even though the narration never takes me into their presence as much as observes from afar. I feel that I am walking the streets of Naples, or Pisa, or small Italian neighborhood, watching the families who can’t see me. I feel I can taste the Italian pastries, and hear the Italian language, and feel the slap of the Italian men who, though they love their wives, must prove who is dominant. Even if only to themselves. Seraillon mentioned on Jacqui’s blog that a friend of his has mapped the streets of the towns in this novel, and the places where the characters meet. I would love to see that. I would love to attempt it myself if I find the time to reread The Story of a New Name. Meanwhile, find brilliant thoughts on this novel here, here, here, and here. Bellezza, friendship certainly can be a complicated matter, and this novel seems to express that beautifully. So do you. Beautiful review, Bellezza. It’s interesting what you say about Lila as there are aspects of her character that I don’t particularly like either but when she’s absent from the narrative I find myself craving her reappearance. Fascinating contrasts between these two girls: their personalities, the different paths they take in life, their choices in love. Like you, I think my affections lie with Elena, but Lila does have that spark, a certain something that makes her such a magnetic character! Many thanks for the link – Scott’s map sounds fascinating, doesn’t it? I absolutely agree that Lila has a spark, without which the book is almost…lackluster. She’s the person I “love to hate” (although of course I don’t hate her; I just don’t admire her). What a wonderful series this is, so compelling to read about the women, their families, and the workings of Italy. My favorite country. Some astute comments on friendship. When I started the series my sympathies were very much with Elena. As it has progressed I find them more and more with Lila. She seems to act as Elena’s (ruthless) conscience, challenging her, reminding her of things she’d rather not think about. Wonderful review and thoughts on Lila. Elena has that kind of relationship with Lila where she almost doesn’t want to be around her, there are indeed periods when they are separated for some time. Yet there is something compelling and addictive about their friendship that keeps bringing them back to each other, despite the negative current that exists. It has always been there and when it surfaces and creates conflict we see them more clearly. Its hard to say what it is but its great to read about how they respond to it. 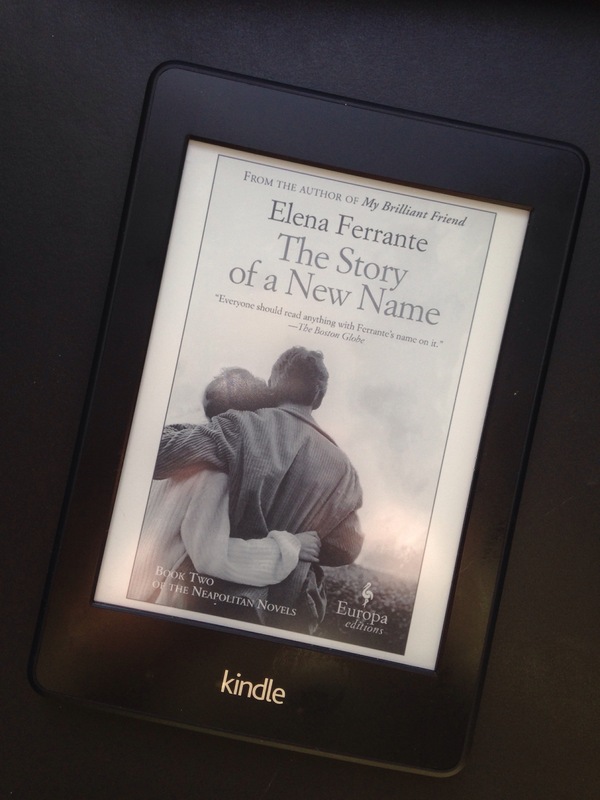 I really loved the way Elena (who I guess is Ferrante) looks at herself so intelligently and candidly, like the way she understands her need to be the good,clever girl and get everyone’s approval. There’s so much personal insight and boldness in facing up to and stating one;s own bad motives and falsities.. I’ve read all 3 in the series now and I think this is the best.